After a week of finding our paws, we are really getting the hang of running around and playing with mum. We really like when people come to the house to play with us and specially little Alex! As our teeth have started to come out now we love a bit of chewing (nothing like a good sleeper). We are going to start weaning this week. Our mum and dad will start making a puree with the solid food to start with and once we get used to it and our teeth are ready we will get to eat the quality food our mum eats! We are also getting used to use the puppy pads and we love to explore around the house. PS. 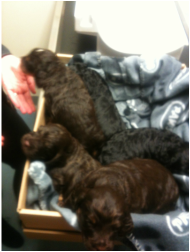 Check out the latest pictures clicking on the current litter page. You will fall in love! Today it has been our first trip out and we have gone to...the vets! Corine and the nurse were really nice to us and they told us we are some of the best pups they have ever seen. They really liked our shiny coats and told us we are getting fed the best milk thanks to the food that our mum eats. Oh and there is more good news, they checked us and told us we are all happy and healthy so live is good! We have been given our worming liquid. It doesn't taste as good as our mummy's milk but it's good for us. We starting to play more and more with each other too! During the last three days they have started opening their eyes more and more and now they are starting to investigate their new surroundings and move about. They are even cuter as they are interacting more & more. Pepa is still looking after them like the very good mum that she is. All of them are gaining weight steadily and they all love a good cuddle. More pictures to come soon...and a video! Keep an eye on the website. Rolo is still for sale. We tried to email you back at the email you gave us but it didn't work. Could you fill up the contact form again with the best email address or number to get you on. The only girl of the litter. First out and keeps all her brothers on their little toes. All black with a white bib. Second one out. He was born only 5 minutes after Daisy so almost twins. 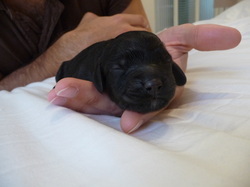 He is all black with a little white bib and we think he might have tan eyebrows but we will have to wait and see. Third one to be born and turning out to be the biggest of them all. He is chocolate and tan with white bib extending down his belly and a white star on his head. A real cheeky chappy! 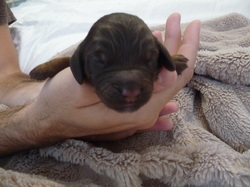 Fourth one out and very similar to his little brother Rolo. Chocolate brown and tan with a little white on his chin. A right cutie that likes a good cuddle. Last one out and a real looker. We are sure Marmaduke will agree as they look like twin brothers! Chocolate and tan with a small white bib. He likes a good sleep (as you can see from the picture). And the puppies are here!!! All the puppies have arrived safe & sound today after 5 hours of labour. Pepa has had a litter of five very cute pups. 1st: A little black with a white bib girl that weighs 300grs. Born at 11.00am. 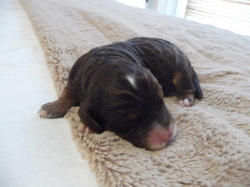 3rd: A tricolor brown tan and white boy that weighs 330grs. Born at 12.00am. 4th: A brown and tan boy that weighs 320grs. Born at 1.00pm. 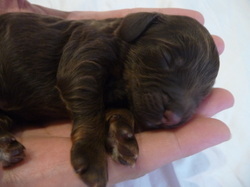 5th: A brown and tan boy that weighs 330grs. Born at 4.00pm. At the moment Pepa is enjoying some quality time with the puppies and taking a well deserved rest. So pictures and names to follow. It's less than 2 weeks to go before the puppies arrive and the whelping box has been delivered. We've put it up and Pepa is enjoying her new bedroom. It looks really cosy and lots of space for her and the pups to spread out. Can't believe they're going to be here so soon - we can't wait! Today we went to the vets to check Pepa is healthy and also to do a scan to see how many puppies she has and their health. She is going to have between 4-6 puppies! As they were moving Corin (our vet) couldn't confirm the exact number but all the puppies were moving inside so they are healthy which is great news. We even saw one of them moving its mouth! We have now bought the special food she will need in the last few weeks of her pregnancy (very important for puppies and mum's health). We are very excited and can't wait for the pups to arrive. It has been 4 weeks since Pepa had a date with Ty the toy poodle and she will be due to have some lovely puppies mid August! Ty is a lovely toy poodle with 5 generation pedigree and he is optigen clear. 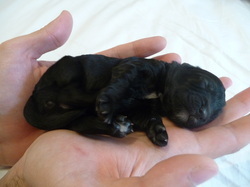 He is a phantom colour ( combination of black tan and white which is quite rare for a poodle). He has a lovely temperament and we found him to be the perfect match for Pepa so we can get the perfect cockapoo puppies with a lovely nature and cute looks.